Disney and Pixar dared to imagine what the world would be like if we didn’t take care of it. 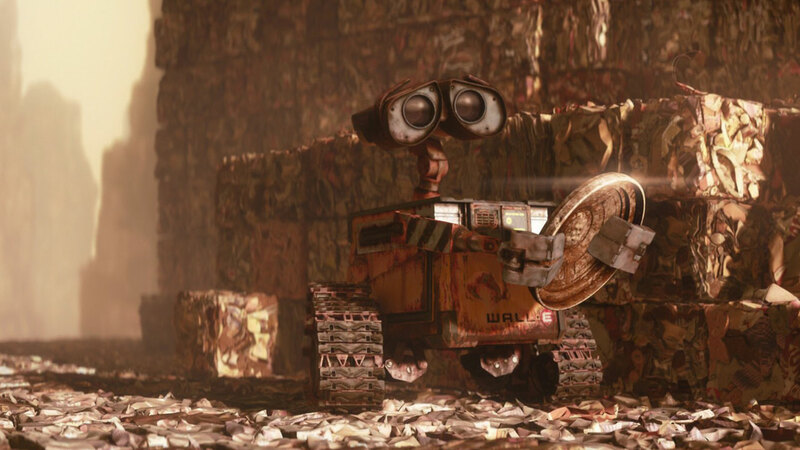 In the movie, Wall-E, the world is so overrun with trash that everyone had to flee to space! They all had to live on a huge spaceship and wander around in space. They all lost their ability to walk. Their bones became very soft and they all just flew around on flying chairs all day. Can you imagine a world without trees? Without grass? Without bugs or animals? Where would we live? Where would our oxygen come from? What if we never recycle? What if we never even try to reuse things? Trash would pile up around us. Can you imagine the smell? "Down To Earth" by Peter Gabriel for the movie "Wall-E"
From that movie, comes a song written by English composer and rockstar Peter Gabriel. The song, “Down to Earth” takes a hopeful view of the future in which people recognize the ramifications of their actions and the beauty that’s worth preserving. 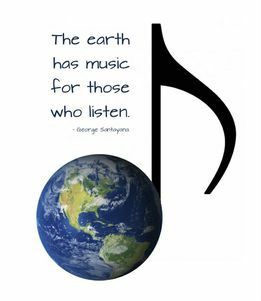 Featuring backing vocals from the Soweto Gospel Choir, “Down to Earth” is an inspired contribution to our Earth Day celebration. 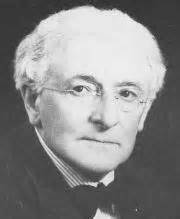 Albert Ketelbey was an English composer, conductor, and pianist. He composed many beautiful pieces of music in the early 1900's. Many of his works reflect his interest in Orientalism, which we studied last week. In music, this is called exoticism. Our listening example today is In a Persian Market. Persia is the old name for modern-day Iran. A lively rhythm and bouncy melody represent camel-drivers gradually approaching the market. Amid the bustle of the market, the cries of beggers are heard in a chant-like melody sung by male voices. 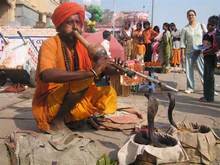 A slower, expressive melody represents a beautiful princess being carried by her servants as she stops to watch the snake-charmer. 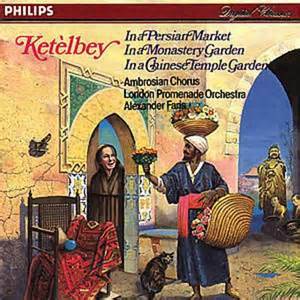 In a Persian Market was one of Ketelbey's most popular works and is still played today on classical radio stations and TV channels. Conductor - someone who leads an orchestra, band or choir by providing visual cues to keep them on the beat while performing. Persia - the old name for the country of Iran. 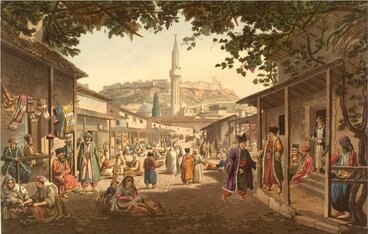 Orientalism - depiction of foreign lands through visual art. Exoticism - using instruments, rhythms and melodies to make music sound like faraway cultures. 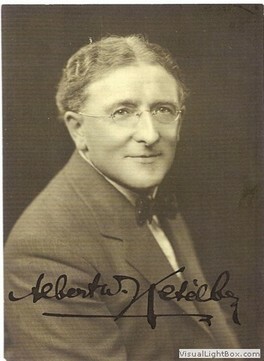 For many years Ketèlbey worked for a series of music publishers, including Chappell & Co and the Columbia Graphophone Company, making arrangements for smaller orchestras. 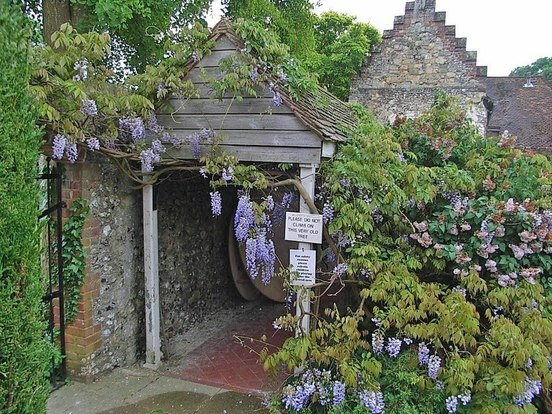 This is where he learned to write music that was light and uplifting, and where he developed his own way of writing. 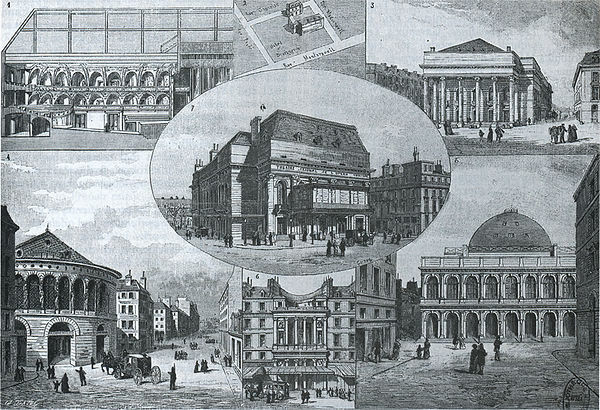 In 1896 Ketèlbey took up the post of conductor for a travelling light opera company; his father, who wanted his son to be a composer of serious music, disapproved of what he saw as a lightweight role. 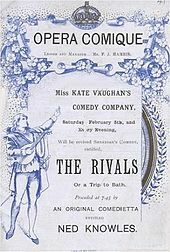 After a two-year tour Ketèlbey was appointed as musical director of the Opera Comique Theatre—at age 22, the youngest theatrical conductor in London at the time. 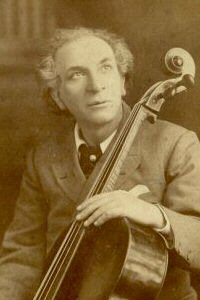 In 1912 the composer and cellist Auguste van Biene offered a prize for a new work to complement his popular piece The Broken Melody. Ketèlbey was the winner of the competition with a new composition, The Phantom Melody, which became his first major success. 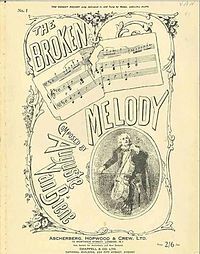 If you were to listen to “The Broken Melody,” by Auguste van Biene and then immediately listen to “The Phantom Melody” by Albert Ketelbey, you would notice similarities in the two pieces. They seem to flow together as if they were all written by the same composer and meant to be one full orchestral work. Both sound haunting and ghostly, but not really scary. 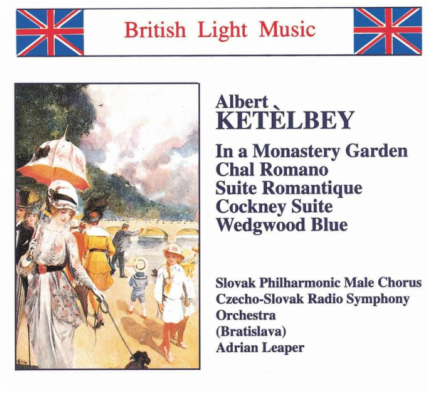 Albert Ketelbey wrote music that would be considered “Easy Listening” music. It wasn’t loud and crazy like rock n’ roll, people didn’t speak their words like rap music, and there weren’t any dancers in the backgrounds of his concerts. His music was meant to simply make you happy. 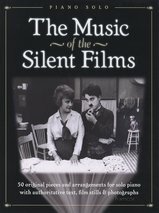 It was in the 1920’s when Albert began writing music for silent films. At the time, there was no real way to add sound to movies. So, music was written for the films, and often, there would be a live piano player at the theatre playing the music during the film. 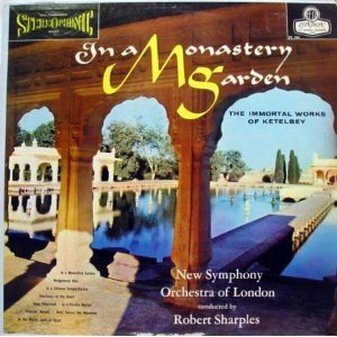 In 1914 Ketèlbey wrote the orchestral work In a Monastery Garden. It was his first major success, his most famous piece, and became known all over the world. 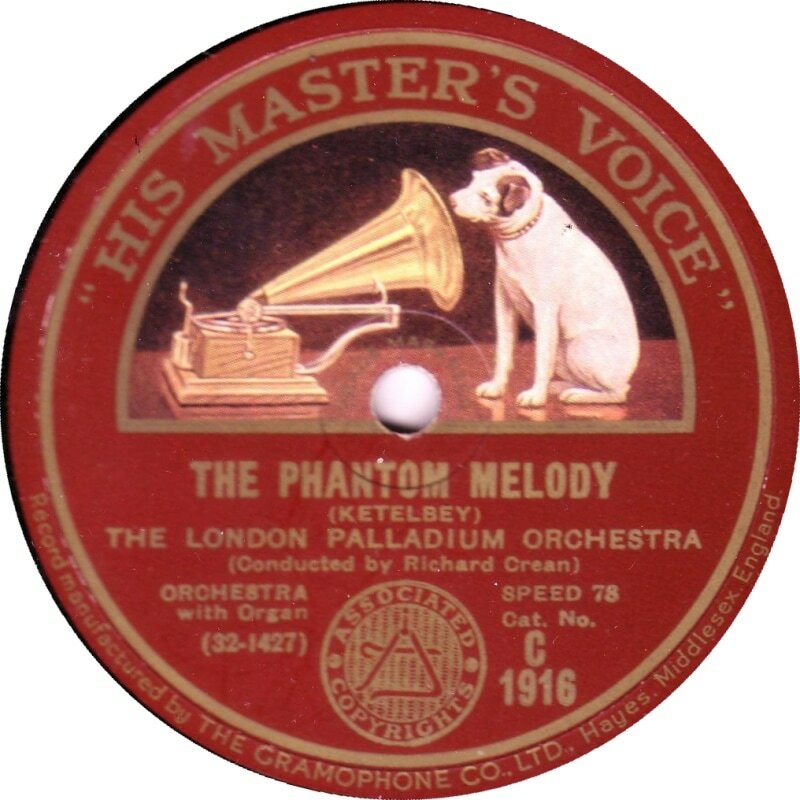 By 1920 over a million copies of the sheet music had been sold. There are two competing stories detailing the inspiration behind the piece: although Ketèlbey later said that he wrote the work for an old friend, he also stated that he composed it after visiting a monastery. Ketelbey was quoted as saying, after having visited a Monastery, “ I had an idea, and when I returned home I set to work to draw a musical picture of the scene as it had impressed itself upon my mind - the chanting of the monks, the serenity and calm of the landscape, and the emotional aspect generally.” While listening to this piece, “In a monastery Garden” you can feel the peace and tranquility through the music. 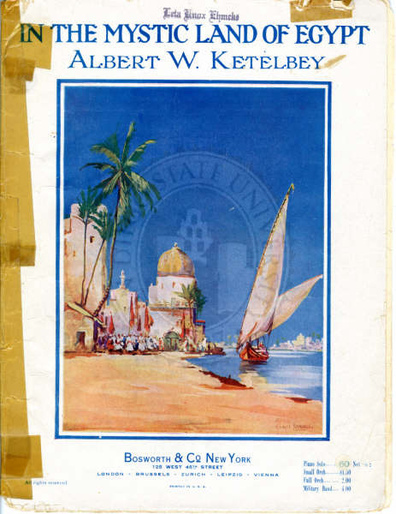 In the music profession, Ketelbey’s name and music are not as well known as other major composers. 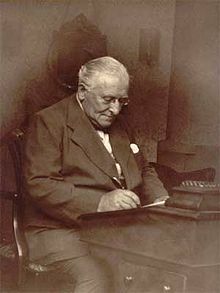 And while it is not proven, Ketelbey is frequently quoted as becoming Britain's first millionaire composer. In 1929, he was proclaimed as "Britain's greatest living composer", based on the number of performances of his works. 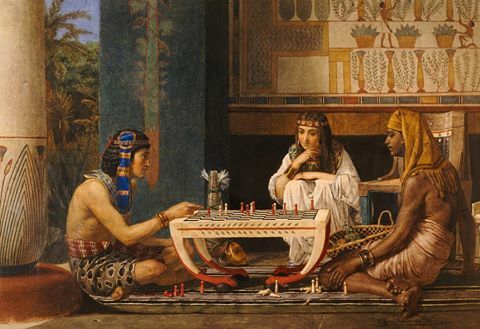 In his spare time, Ketelbey’s hobby was playing billiards. Musicians do what they must to preserve their favorite music. 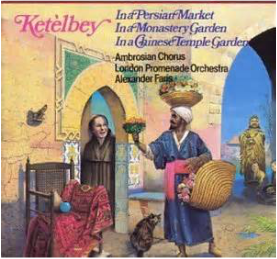 Our listening example, In the Mystic Land of Egypt, is another of Ketelbey's exotic compositions. Some interesting comparisons can be found between this music and his other works. Most are written in A-B-A form, where a musical theme is presented at the beginning, called the A section; then a contrasting theme, called the B section, is heard; and ending with the A section music. Another similarity is that the first melody is stronger and sounds more assertive or domineering, while the second theme is slower and calmer, with a beautiful, expressive melody. Also, Ketelbey did something unusual with his music. He would have a choir sing along with the orchestra to help portray the different moods he wanted to create. 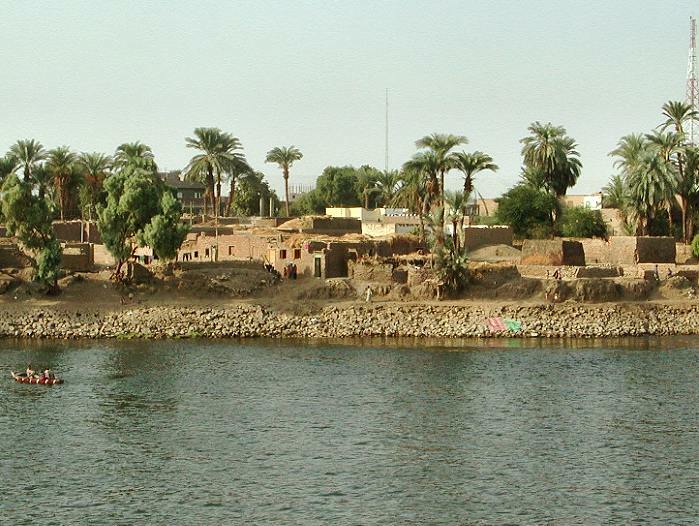 Here’s the story for In the Mystic Land of Egypt: A detachment of native soldiers approach and pass through a village. 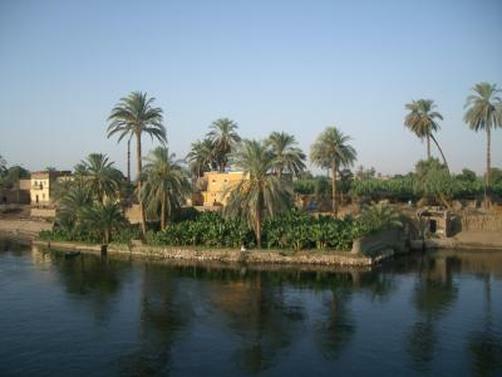 Then a beautiful love song is heard softly across the water from a boat on the Nile River. A short melody is heard depicting an Arab playing his pipe. The soldiers then return and some of them join in singing the song. LISTEN FOR . . . An opening downward scale creates a mood of mystery. 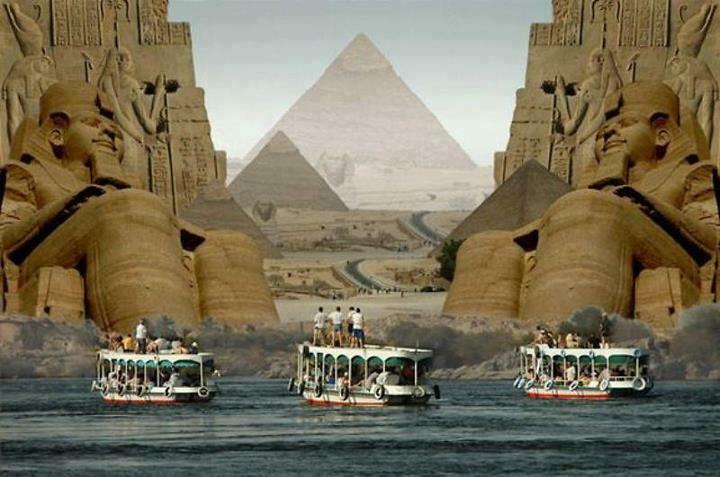 Is it a crocodile sliding into the Nile River? 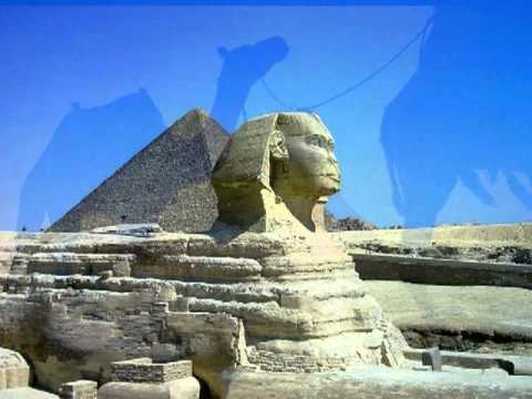 Is it a camel or elephant kneeling down for a rider to climb on? Following this is rhythmic "traveling" music of the Arab soldiers. After a minute and a half, the love song begins. And your eyes are ever smiling. This melody is repeated, louder with snare drum rolls adding strength to it. In the final minute, a short interlude suggests the Arab pipe music. The music gradually fades off "into the distance". Just as painters use similar paint colors and brushstrokes to create different pictures, Ketelbey used the elements of music to create descriptive musical stories that express the mysteries of the Orient. 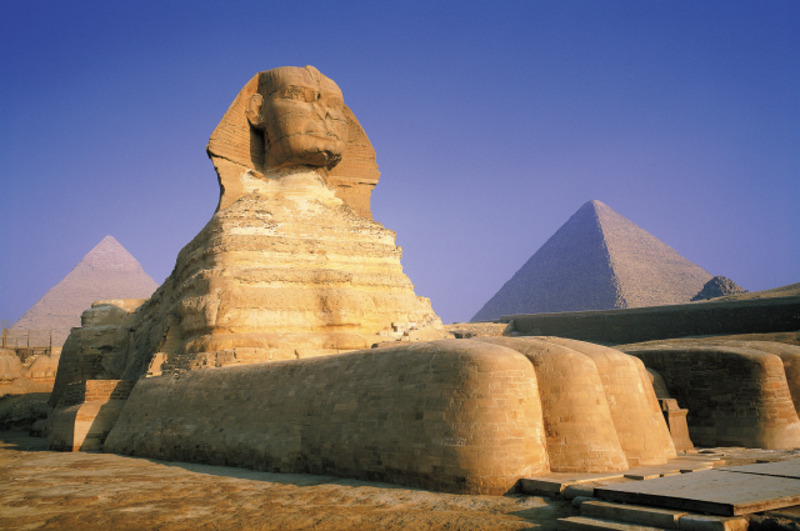 Watch a slideshow on pictures of Egypt -- Egyptian artwork, the pyramids, the Sphinx, the Nile River -- while listening to the music. Compare - contrast to the music in the next example, In a Chinese Temple Garden. the same downward sliding scale, the strikes of a gong, a chant-like melody. Listen for the abrupt change in mood between minutes 2:00 and 3:00. The ending gradually gets faster and more exciting. The pictures of China in this video are a creative visual representation of Ketelbey's music. Form - one of the five elements of music. The structural organization of the elements of music in a composition. Frameworks: M.4.2., M. 4.3., M.4.4., M.5.1., M.5.2., M.5.3., M.5.5., M.5.6.